Check the socket with other electrical appliances to ensure that the issue is not with the socket itself. Water flow sensor is broken Go through the checklist, if this does not resolve the issue, the Chlorinator will need replacing. The quantity of salt is too high Too much salt has been added Disharge 20% of the pool water. Fill in with the same quantity of fresh water and wait approximately 3-4 hours and restart the Chlorinator. Repeat until the salt levels are normal. Please check the socket with other items to ensure that the issue is not with the socket itself. The Chlorinator working time is not enough The operating time is not set correctly Check the operating time indicated in table 2 (or table 5 if you pool is not listed in table 2) inside the owner’s manual. This should refer to the water quantity of your pool and environmental temperature. Once you define the correct operating time, set the Flowclear Chlorinator accordingly. Clogged or dirty electrolytic cell Poor maintenance – debris has stopped the water flow Turn off and unplug the Chlorinator. Remove debris screens and put the stopper plugs on. Close the connection valves and detach the hoses from the Chlorinator. Remove the debris from inside the electrolytic cell with a high pressure garden hose (only flush from the direction of the water inlet to avoid damage to the flow sensor; Do not use any metal tool to scratch the plates of the electrolytic cell). Reassemble the Chlorinator. Limestone due to hard water on the electrolytic cell Turn off and unplug the Chlorinator. Remove the debris screens and put the stopped plugs on. Close the connection valves and detach the hoses from the Chlorinator. Lift the free ends of the two hoses upwards in a ‘U’ shape; Fill in the electrolytic cell with a mixture of 50% vinegar and 50% water. This will need to be used for approx. 2 to 3 hours. Rinse out the hoses and electrolytic cell with a lot of water and attach the hoses to the pool and the pump. Reassemble the Chlorinator. How do I choose the correct pump for my Chlorinator? The compatible pump flow rate is between 700 gal to 4000 gal. What type of salt shall I use? Use only sodium chloride salt (NaCl) that is at least 99.8% pure. It is also acceptable to use water conditioning salt pellets (the compressed form of evaporated salt), but it will take longer to dissolve. The purer the salt, the better the life and performance of the chlorinator. Do not use iodized or yellow (yellow prussiate of soda) colour salt. For further details, please consult your salt supplier. How much salt should I add to my pool for the first filling or once I have changed water? Is it necessary to add salt during the usage period after having added the initial quantity? How often shall I check the water chemical conditions? Bestway technical team recommends testing the pool chemicals before every use. How do I use Bestway Test Strips? The Test Strips test “Free Chlorine”, “pH” and “Total Alkalinity” levels. Dip one strip into water, no more than 46 cm (18”) below the water surface and remove it immediately. Hold the strip level for 15 seconds to avoid reactant dripping from one test pad to another. NOTE: Do not shake off the excess water. I have followed the instructions to set the timer, but my Chlorinator is activating at different times during the day. The automatic status shifts into the standby mode when the Chlorinator has terminated the operating times. In this mode the power light becomes red and all other lights are off. How much salt shall I add if the level of chlorine is below 2ppm and the operating time is as stated? 1. Unplug the chlorinator and THEN the filter pump/sand filter. 3. Run the filter pump/sand filter for 8 hours. When can I use the Chlorinator after adding the salt? After adding the salt, run the filter pump/sand filter for 24 hours to dissolve salt completely. Brush the salt with the help of a broom from the bottom of the pool to make it dissolve. Then start the chlorinator in accordance with the Operation Instructions section of the Owner's Manual. What are the correct chemical conditions? 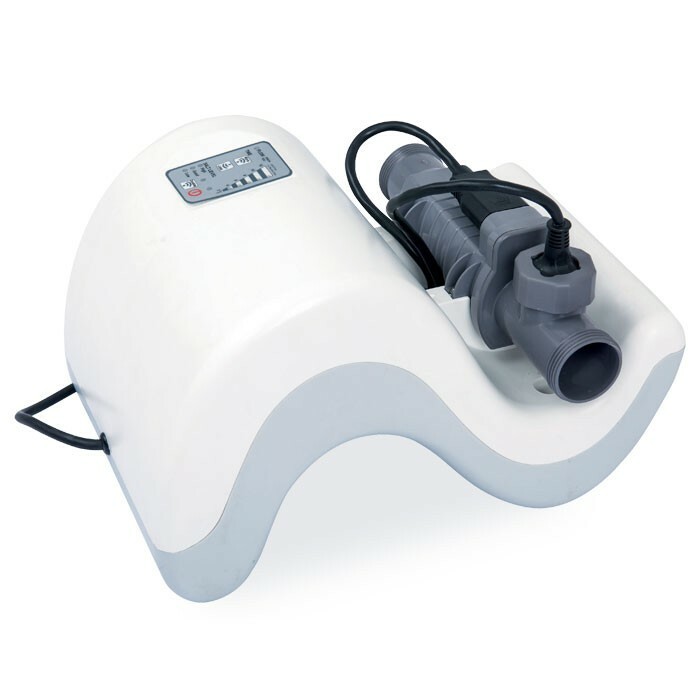 Ensure that the Chlorinator is being used with a compatible pump with a flow rate of between 700 gal. and 4000 gal. Ensure that the correct salt is being used in the Chlorinator. This will need to be at least 99.8% pure. It is also acceptable to use water conditioning salt pellets (the compressed forms of evaporated salt). This will take longer to dissolve. Do not use iodized or yellow (yellow prussiate of soda) colour salt. Ensure that the salt level in the water is 4,500ppm.